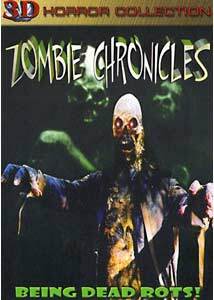 The Zombie Chronicles is one of several straight-to-video features filmed in stereoscopic 3-D as part of a series showcasing the 'Razor 3-D' system, which allows viewers to wear true stereoscopic glasses and witness three-dimensional effects without the messy red/blue technique used in the past. Sadly, Zombie Chronicles lands amongst the worst films I've ever seen, but by no means should reflect poorly on the Razor 3-D system (more on that later). Now, I've been "around the block," as it were, with horror films my entire life. I've seen good horror films that cost millions of dollars to make and I've seen good horror films that cost a few hundred dollars. I've also seen absolutely atrocious horror movies made on shoestring budgets that were so inept, they were tremendously entertaining as a "so bad it's good" thing. Zombie Chronicles is filmmaking at its worst, though, and not even the few chuckles and giggles you'll get out of it make it remotely worth sitting through. The plot, loosely described, is about a journalist, Tara Woodley, hoping to uncover some goodies about a supposed haunted town called Skokesboro. As the film begins, she's lost in the woods looking for a way to find Skoesboro and happens upon a strange hitchhiker named Ebenezer (Ebenezer?). Ebenezer claims he knows the way, so he takes her on the right roads. Along the way they meet some weird folks and Ebenezer decides to tell everyone some old yarns about just how evil and sinister Skokesboro really is. So, in a format that mirrors other "multiple tale" movies, Tara is given a crash course on what makes Skokesboro so frightening: lots of zombies who love to dine on human flesh. This sounds like a cute premise for a lot of random gore and revenge stories, but nothing much comes out of it. Painfully low-budget, the film seems to lack any serious passion behind it. The acting is amazingly bad, the camera work is almost entirely handheld (done with what looks like a standard home video camera), and the special effects, though competent, are executed without any direction. It's like no one wanted to be making this project, much less star in it and try and do a good job. If some high school students were given a camera, told to make a horror movie, and then had some money for special effects, you might wind up with this. It's literally that amateur. All this alone does not spell doom for any movie, it's primarily the lack of any compelling direction or style. Usually, clever filmmakers on low budgets like this usually make their work humorous or intentionally silly, but there's very little of that kind of thinking. It wants to be taken at least partially serious, but it's not possible to do so. In an attempt to find something good to say about Zombie Chronicles, all I can think of is that the locations are at least decent. Set mostly in the woods and in abandoned, old buildings, the filmmakers at least got that right. Unfortunately, the nighttime sequences were lit poorly, and so atmosphere is low on the scale. Gore lovers might enjoy some of the bloodier parts that are suitable gruesome, but even that isn't very enjoyable overall. There's no camp or silliness, it's just inept and uninspired. Avoid at all costs. Image Transfer Review: The image is obviously an analog transfer, and looks very much like a videotape might. There are scanlines, occasional tracking issues, and an overall relatively low resolution, and I'm referring to the 2-D transfer. So, while compression artifacts are minimized, it doesn't look all that great. No forms of special lenses or filters were used, so the whole image looks much like the average home movie might. In other words, there's no real cinematography to speak of. These issues are fleeting in the 3-D version, as viewers will most likely be paying more attention to the effects and such, not to mention the slight flicker that occurs when using stereoscopic goggles. About 90% of the film was made with stereoscopic processes, which adds layers of depth to the image. The relationship between distances is made more realistic, and the end result is an impressive effect where the image takes on distinct, scrolling elements. This isn't like old-fashioned red/blue alternating 3-D, it's a more sophisticated process that not only preserves normal color, but can extend well into the picture, and not just effect things thrust into the camera. Audio Transfer Review: The stereo audio is serviceable, but nothing too spectacular. Much of the movie seems to have used in-camera sound or only small, basic microphones to record the sound, so some of the dialogue and effects are a bit hard to hear and not very impressive. Extras Review: The disc itself has nothing in the way of additional features with the exception of an original trailer and a trailer for Camp Blood, another Brad Sykes video feature. There is also a test function to make sure that your 3-D goggles are working properly. Just to confirm it, viewing the 3-D version of the film does require a Razor-3-D system set up. It's not a very complicated device and is rather unobtrusive. The set-top box is about the size of an average television remote and hooks up to the out-going feed of your DVD player. It doesn't interrupt the cable, meaning you can leave it hooked up and watch anything you want. When viewing a stereoscopic film, you just turn the device on (it's powered by a 9-volt battery), and plug in the lightweight glasses (which are impressively small for stereoscopic translators, barely bigger than sunglasses). The core Razor 3-D kit comes with two pairs of glasses and a double cable, but numerous other viewers can be accommodated by purchasing wireless goggles. The wireless goggles don't work quite as well, and require batteries, but I honestly don't know if just splitting the cable some more would work. While Zombie Chronicles might not be the best example of a 3-D film, the potential for this system is enormous, not just for movies, but video games as well; in fact, an adapter for 3-D PC games is already available. There's some interesting future stuff planned for the kit (including 3-D versions of stuff like Night of the Living Dead and old Flash Gordon serials), and all the info can be had over at Razor 3-D's website. If you're looking for a good zombie movie, this is not it. Even for a laugh or a lighthearted movie party, this one might just kill the atmosphere. The 3-D effect adds very little to an extremely mediocre horror film. Described as being "in the tradition of Tales From the Crypt and Dawn of the Dead," it misses by a longshot. By all means, please rent one of those instead.